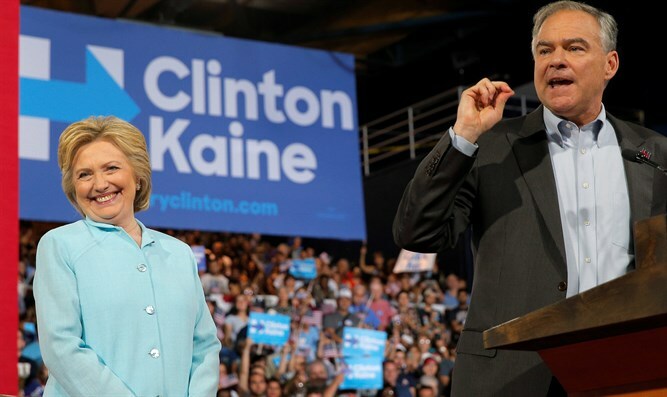 Kaine appointed anti-Israel, pro-terror Muslim leader to head Immigration Commission; called criticism of pick 'xenophobia'. Virginia Senator and former Governor Tim Kaine has been the Democratic Party’s presumptive Vice Presidential nominee for just three days, yet the pick has already drawn fire from the pro-Israel community due in part to Kaine’s robust support for the Iran nuclear deal, his boycott of Israeli Prime Minister Binyamin Netanyahu’s address to Congress in 2015, and his ties to a left-wing NGO. Now, a controversial appointment made during his tenure as Governor of Virginia has raised new questions about Kaine’s bona fides as a self-described “strongly pro-Israel Democrat”. In 2007, then-Governor Kaine appointed Esam Omeish, a Libyan-born physician and then-president of the Muslim American Society, to Virginia’s Immigration Commission. This came despite Omeish’s history of ties and expressions of support for radical Islam and Jihadist terrorism. Omeish is a long-time member of the Board of Directors of the Dar Al Hijrah mosque, which two of the 19 terrorists responsible for the 9/11 terror attacks attended, as friends of the mosque’s imam. That imam was Anwar al-Awlaki, the radical Salafist cleric who later fled the United States and joined Al-Qaeda, after settling in Yemen. In 2010, President Obama placed al-Awlaki on the CIA “kill list”, citing his orchestration of deadly terror attacks against Americans. In 2011 a US drone strike killed al-Awlaki in southeast Yemen. But Omeish was not merely a congregant at the Dar Al Hijrah mosque where al-Awlaki preached; in 2000, he was vice president of the mosque and was responsible for vetting and hiring the radical cleric as the mosque’s imam. In addition to Omeish’s ties to radical Islam, his recorded comments prior to the 2007 appointment by Governor Kaine made his support for Jihadist terror even more explicit. During a December 22, 2000 speech at a Jerusalem Day Rally in Lafayette Park, in Washington D.C., Omeish praised “the Jihad way” to “liberate your land”. "We, the Muslims of the Washington metropolitan area, are here today in subfreezing temperatures to tell our brothers and sisters in Filastine [Palestine], that you have learned the way, that you have known that the Jihad way is the way to liberate your land. And we, by standing here today, despite the weather, and despite anything else, we are telling them that we are with you, we are supporting you, and we will do everything we can inshallah [Allah willing] to help your cause." In 2004, Omeish explicitly praised Hamas leader Sheikh Ahmed Yassin. Governor Kaine’s selection of Omeish was criticized by state Republicans, who said the governor had failed to properly vet the appointee. C. Todd Gilbert, a Republican delegate from Shenandoah County, wrote to the governor, noting the Muslim American Society’s “questionable origins”. "I don't know how a problem of this magnitude could have slipped through the Governor's screening process," Gilbert later said in a statement. "Even a cursory internet search about the appointee in question would have also easily identified him as a leader of a potentially radical northern Virginia mosque." Kaine and his administration initially brushed off the criticism as mere Islamophobia. Yet Omeish’s ties to terror and explicit support for violent Jihad quickly became apparent, ultimately leading Kaine to pressure Omeish to step down.